Cornwall sits at the south-western end of the UK. Cornwall is much warmer than the rest of the UK which gives it a head start in the spring, a longer summer, and foods not easily grown elsewhere. Cornwall sits at the very south-western end of the UK. Stand at the promontory (now a theme park) of Land’s End, look out to sea, the next land mass is the US. The industries, both past and present, have influenced some of the most famous dishes of the county, the most notable being the Cornish Pasty. Tin mining was once one of the main industries and It is generally believed that the pasty evolved for Cornish tin miners, who, unable to return to the surface at lunchtime had a hearty, easy to hold and eat, lunch dish. Fishing is still a major industry which is no surprise given that Cornwall has two lengthy coastlines, one on the Atlantic, the other the English Channel which is a coastline of 326 miles. Fishing has always been integral to Cornish life; the industry provides thousands of jobs and many millions of pounds for the local economy. There is a wealth of fish and seafood from these shore including, mussels, crab, lobster, turbot, sardines, pilchards, sea bass and much, much more; 40 different species are landed every day. ﻿Agriculture and dairy farming are also important industries for the county as a look at some of the cheeses produced in Cornwall, and the famous clotted cream will bear testament. A Cornish Cream Tea is one thing that must be done on a visit to the county, fresh scones, thick jam, and a pile of Cornish Clotted Cream. Locals recommend the Smugglers Cottage at Tolverene owned by Tregothnan, the only place in the UK where tea is grown. The cottage is just as you would imagine, with a thatched roof and tiny windows. The Tregothnan tea is extremely flavorsome and the scones light and fluffy. The jam normally served with a Cream Tea would be strawberry, but here it is a jam made from Kea Plums, which are an old variety of Cornish plum grown in this part of Cornwall. Clotted cream is a silky, yellow cream with a distinctive crust on the surface. Clotted cream is made by heating unpasteurized cow's milk, or full cream milk, which then is left in a shallow pan for many hours which causes the cream to rise to the surface and 'clot'. 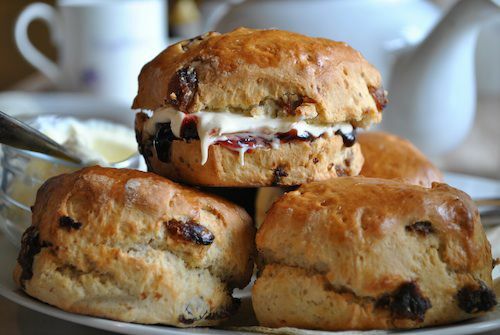 Clotted cream is an essential component of a Cream Tea, served in place of butter to spread on fresh scones. One of the most famous dishes to come out of Cornwall, the Cornish Pasty is known and loved throughout the world. The Cornish pasty is known and loved throughout Great Britain and Ireland and fierce arguments abound as to the origins of Cornish Pasties with neighboring Devon also laying claim to the origins of the pasty. Whatever the origins, a Cornish Pasty Recipe is so easy and fairly quick to make. It is generally believed that the pasty evolved for Cornish tin miners, who, unable to return to the surface at lunchtime had a hearty, easy to hold and eat, lunch dish. With their hands often dirty from a mornings work, the pasty could be held by the thick pastry crust without contaminating the contents. The thick crust also acted as an insulator, keeping the contents warm for several hours. Pasties were often also made with a meat filling at one end and a sweet filling of fruit or jam at the other - a complete meal in one! While there are no set ingredients of the Cornish pasty, traditional recipes will always use minced or diced steak, onion, and potato wrapped in shortcrust pastry. Variations include the addition of swede or carrots, even peas but a Cornishman will tell you these are not the genuine article.